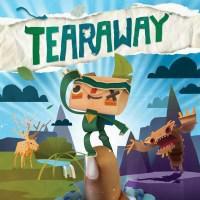 A charming collectathon platformer in a papercraft world. There’s a light tone, a strong sense of adventure, and an emphasis on creativity and self-expression resulting in a very similar mood to its creator’s previous work, Little Big Planet . You’re occasionally tasked with designing aspects of characters or the environment and can create your own decorations to place on the player character. Progressing through the game also unlocks downloadable papercraft PDFs so you can build game characters in real life. The game is notable for being the only Vita game to actually make decent use of all the Vita’s gimmicky features (touch screen, rear touch panel, front camera, rear camera, microphone, gyroscope - though there’s only so much good you can do with a gyroscope when the object you’re tilting also has the screen on it). As a result, there are a lot of unusual mechanics, many of which are interesting and satisfying and most do not outstay their welcome. It’s generally pretty forgiving and not that challenging, though if you’re going for the platinum trophy there are a few difficulty spikes. The ending is surprisingly sweet.